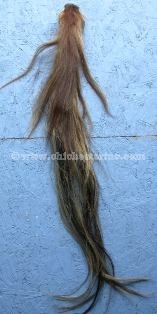 Click HERE for a close up picture of a dried tail. 2) scraped, de-boned, washed, and tanned. Click HERE for a close up picture of a tanned tail. The first 6" or so at the base of the tail where it attached to the body is quite hard and stiff. 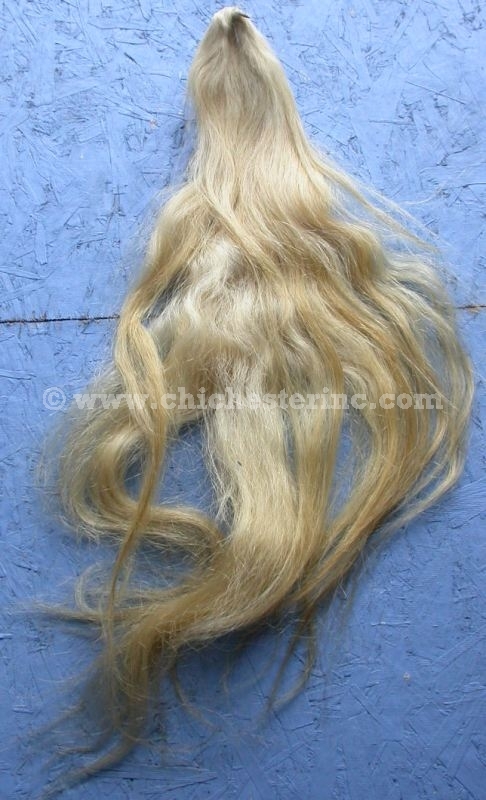 On the tanned horse tails, this part is a little softer and more flexible than on the dried horse tails. 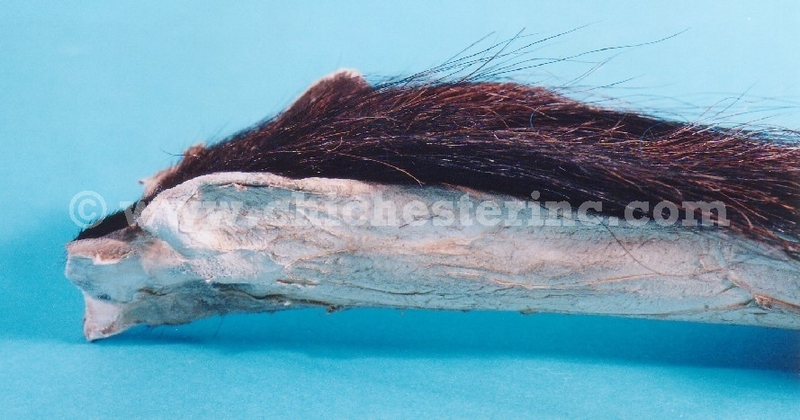 This part of the tail is about 3-4" wide. These tails fall mostly between 20" and 40" long, and can be as short as 15" or as long as 51". They come in different colors, predominantly black with a little brown. 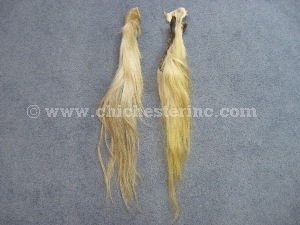 There are a few blonde ones, as well as some salt & pepper colored. 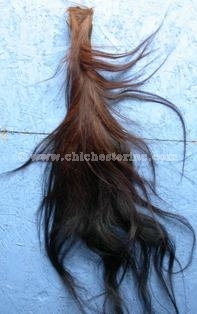 The multi-colored tails are usually a combination of brown, red, and blond. Native Americans use them as hair on their False Face Masks. They are also used on carousel horses and Halloween costumes. We do not recommend attempting to tan the dried tails by yourself. Please note that although the tails have been deboned, there may be small pieces of bone buried deep inside the tail. Do NOT comb when just removed from hot water or the hair may fall out. Horses are not an endangered species. No horses are killed just for the tails. They are not subject to CITES or USFWS controls. We also bundled horse hair. 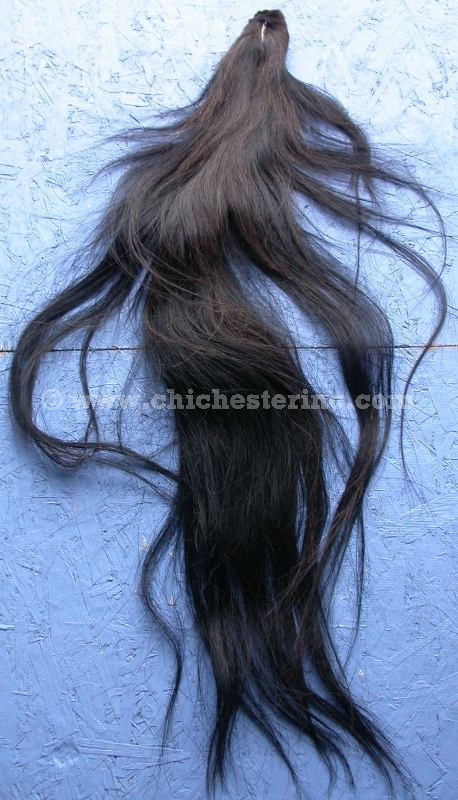 Click HERE to go to the Horse Hair page. 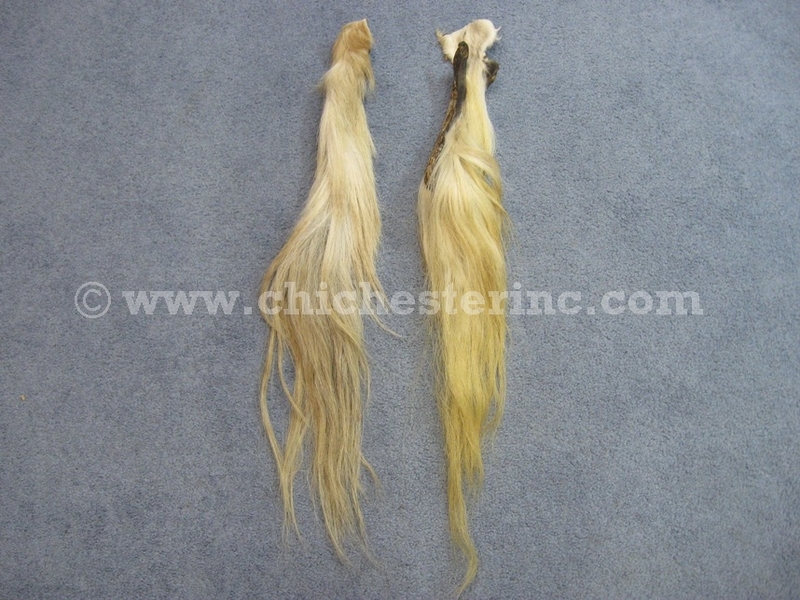 We do not recommend that the DRIED horse tails be exported to Japan and Italy. We had a shipment destroyed by Japanese customs in November 2005. Japan is notorious for rigid customs rules. We had a shipment returned by Italian customs in March 2013. We cannot get a veterinary certificate for dried horse tails. You may have greater success getting tanned tails through customs in general. Please note that there are ranges within in each color. 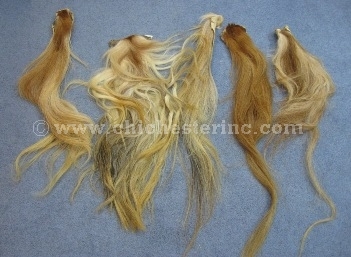 These are just samples to give you an idea of what you might get if you order a certain color. Salt & Pepper horse tail. Some have less white or blond in them. Some tails are more strawberry red than this one. 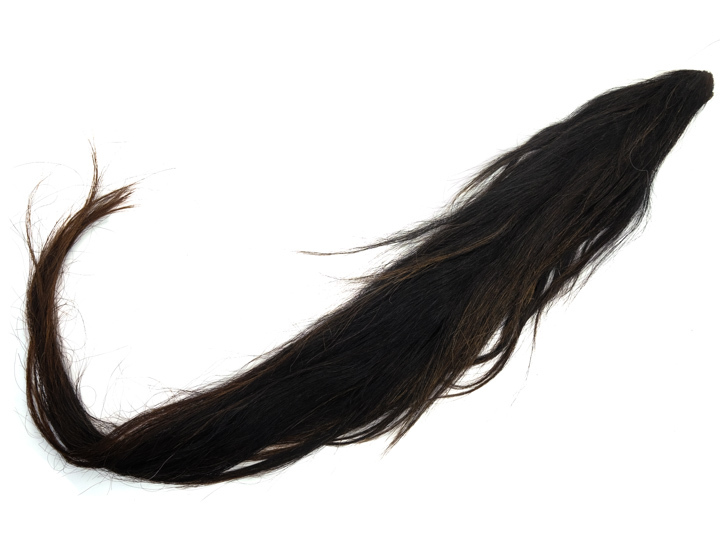 The horse tails weigh approximately one pound each. To calculate shipping costs for 1-10 tails, allow 1 to 2 pounds extra for the weight of the box. For more than 10 horse tails a heavier box is required, so allow 2-3 pounds extra for the weight of the box.